Data-based decision making is imperative to growth yet we find many organizations we work with have untapped potential in their data. We help our clients extract and analyze the wealth of information available to create valuable benchmarks, segmentation and gain actionable insights that align with their objectives. 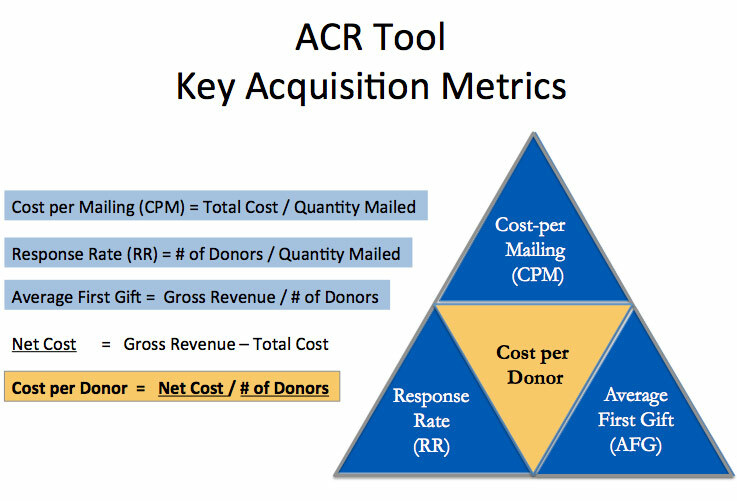 One of the tools we created to help our nonprofit clients measure the actual cost per donor is our ARC tool which examines the relationship between average first gift, response rate and cost-per-mailing. We also developed a core lifetime value model to do a class of analysis within their donor database and identify the key donor segments they should be tracking in their data. Many nonprofits review their results on donors in total, looking at useful metrics like cost-per-renewal, net revenue, etc. But beware of averages! Underlying these overall averages are key numbers that can change the frequency that you contact your current donors. The first key is to identify each donor that gave over $50 in their first gift. Their lifetime value is over 10x the person who first gave you $20! Their higher retention, increase in giving over time, and larger one-time gifts are almost always dramatically higher … and you can start by acknowledging their contribution after one gift. The second key is to look at those retained after their third gift. If you have a yearly retention level below 80% of these folks, you are missing real opportunities. The third key is to watch for people who give their second gift in one calendar year. They are the best prospects for long term retention and if rewarded with a meaningful message that acknowledges their importance to you, they may continue to increase their frequency up to four times a year. Usually their giving stays at their “average gift” so it is important when you thank them that you remember their cumulative total for the year. By partnering closely with our clients we help them get the most out of their database and convey insights in a way that leads to lucrative decisions and improved ways to measure critical constructs. Receive our latest insights, exclusive research, free resources and eBooks straight to your inbox once a month. Fill out the form below so you don’t miss out! 2019 © McQM&A. All rights reserved.